The good news is – this ice cream tastes AMAZING. The bad news is – it’s mushy! It really didn’t freeze well at all. Which doesn’t make for a nice picture. But don’t let that stop you from making it. I’m guessing the consistency isn’t thicker because this is kind of a “short cut” recipe. And I’m totally okay with that. Sooooo good. Combine all ingredients together. Chill in the fridge for about half an hour. Freeze according to ice cream maker instructions. Serve with a little Baileys drizzled on top. 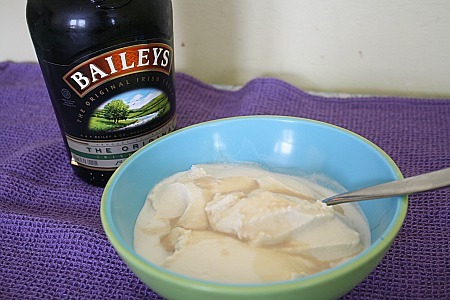 I wonder if maybe the alcohol in the bailey’s is keeping it from freezing?? I’m going to try it anyone! At the least it will make for an awesome milkshake.